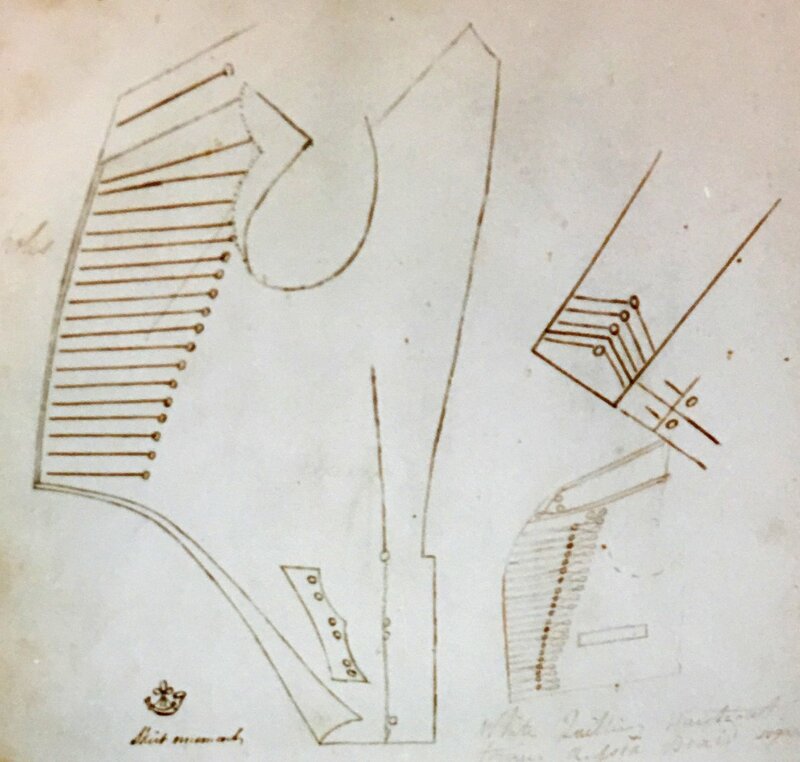 The evidence trails left by Georgian county militia regiments are sometimes quite generous – prints, portraits, uniforms, unit histories … Odd then, that so little seems to be left, at least in the public domain beyond the archive bundles, of the Warwickshire Militia. Charles Lethbridge Kingsford’s The Story of the Royal Warwickshire Regiment (1921) has a couple of pages – the usual dates of embodiment and disembodiment, names of forgotten colonels and so forth, but it’s not much. 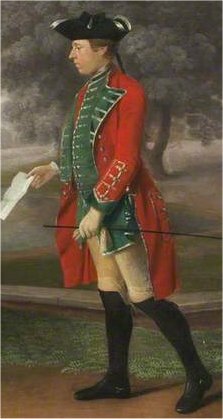 Lawson’s History of the Uniforms of the British Army cites a single inspection report, while maps of militia encampments of the 1778 to 1783 embodiment suggest that the regiment’s green facings were of a mid shade, with a bluish tinge. Here then, judging by the facings and silver lace, must be a Warwickshire officer. (Click to enlarge.) 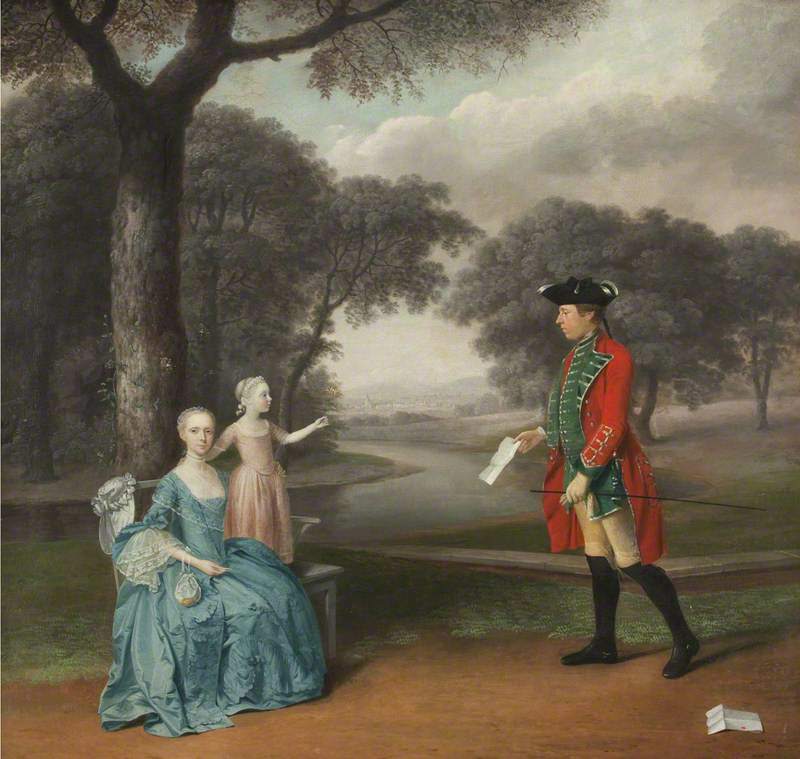 The subjects of this 1763 portrait by Arthur Devis are Francis Vincent, barrister, and his wife and daughter at Weddington Hall in Warwickshire. (The painting is now at Preston, and also viewable on the Art UK site, here.) The composition is a little strained, and Vincent, who clearly posed separately for Devis, seems detached, even a little out of scale. The date, if accurate, would correspond with the end of the regiment’s first period of embodiment and Vincent’s return to his family. The papers in his hand and on the floor clearly tell a story, but his arrival with the good(?) news has an odd solemnity, as does the gaze of Mrs Vincent as it meets the viewer. It’s a strangely compelling image. But can it be a sole survivor? 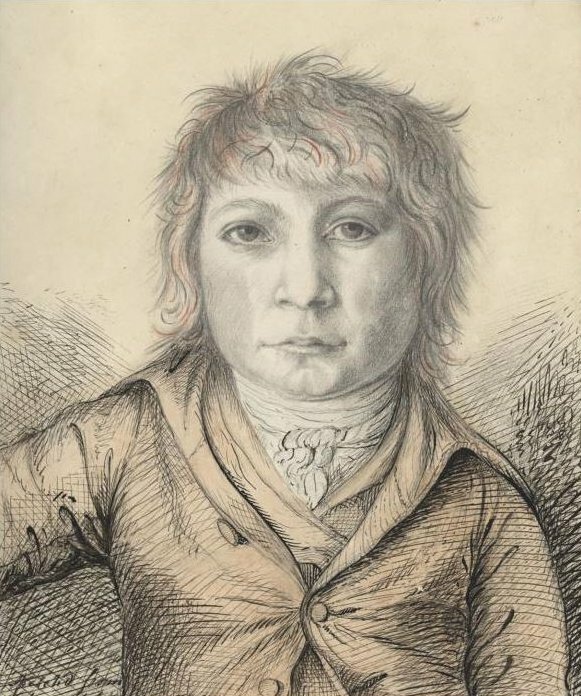 Where are there other images of the Georgian Warwickshires? The tightening of nationalist, loyalist and unionist opinion in response to the loss of the American colonies was, as they say, a seismic shift in the zeitgeist of Albion between the close of the American Revolution and the height of the Revolutionary and Napoleonic Wars with France. Linda Colley, in her celebrated study Britons, has documented this convincingly, if a bit wordily. We now so much take for granted the royalist hegemony of the later years of George III that it’s easy to overlook just how progressive and egalitarian Enlightenment culture had been. In the 1790’s, waving a liberty cap in public could have got you into a spot of treasonable bother. So it’s surprising to find an English militia regiment, only ten years before, proudly flaunting this emblem as a sign of patriotic and constitutional loyalty. Cartwright’s family were prominent landowners in Nottinghamshire, and had been ardent royalists during the Civil War. 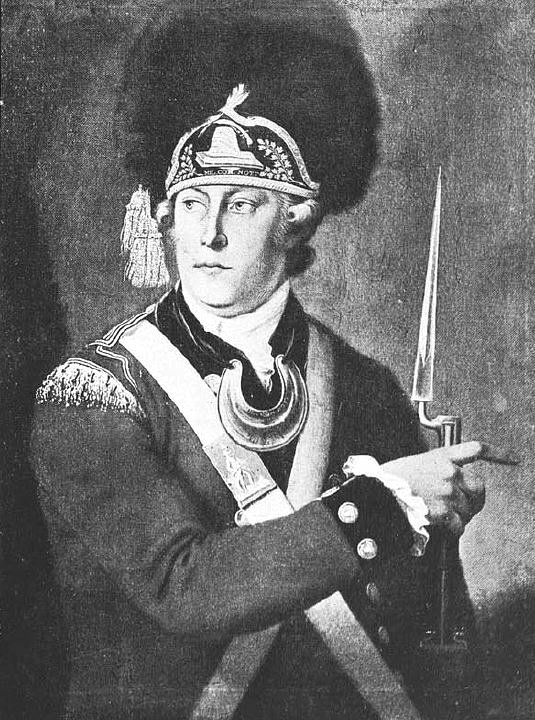 After retirement from a creditable naval career through ill health in 1770, he was appointed Major of the Militia in 1775, and in the general absence of the Colonel and Lieutenant Colonel, had effective charge of the regiment for some years. His progressive approach to command combined rigour with the careful avoidance of unnecessary severity; he was, for instance, one of the first officers to procure a general issue of greatcoats, for the comfort of his men. Despite Cartwright’s military enthusiasms, he was an advanced Whig in politics, authoring many political tracts and pamphlets, including The Commonwealth in Danger of 1794, which achieved a passing notoriety. In 1791, two years after he had openly celebrated the fall of the Bastille at a London hotel, his commission was withdrawn and he was dismissed. 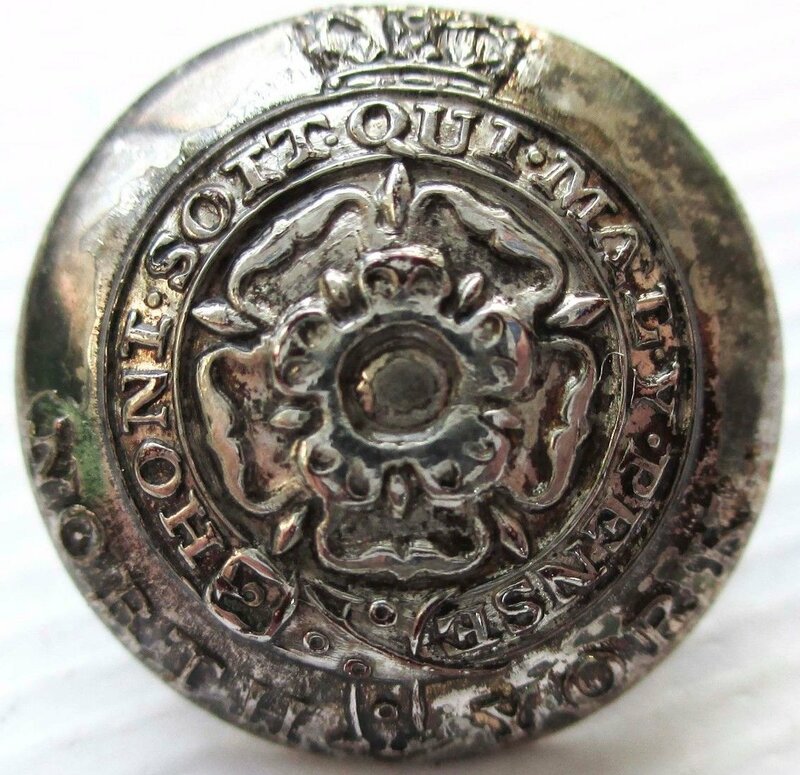 In the post-Cartwright period, the regiment’s new buttons bore prominently the monarch’s crown, and in 1813 the “Marksmen” were re-branded as the “Royal Sherwood Foresters”. … What a difference! To misbehave and to be treated like a base Slave, tormented by the stings of remorse, shame, and fear: Or, to act as becomes the Defender of his country’s Liberty, and to enjoy the grand privilege of Freedom, that of living without fear of any Man. 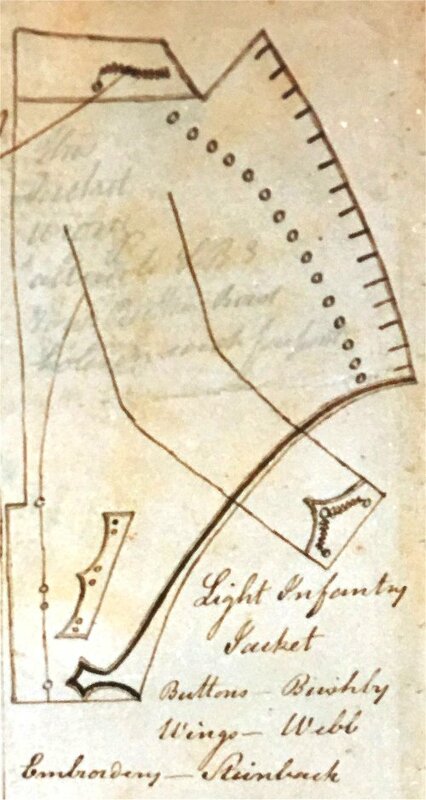 It was with a Design to impress continually these ideas upon our Minds, that the Device and Motto, which are worn upon the Button, and borne in the Colours of the Regiment, were chosen. – The Book is an emblem of Law; and the Cap, of Liberty: so that the Device represents Liberty supported by Law, and defended by the Arms of the Militia. – The Motto in English would run thus; – “For our Laws and Liberties.” – Such a Standard no Englishman can quit but with his Life. Of a similar nature is the design which adorns the Clasps of the Officers Sword belts. The militia by its institution is not intended to spread the dominion or to vindicate in war the honour of the crown, but it is to preserve our laws and liberties, and therein to secure the existence of the state. It is in allusion to this specific duty that I thought the sword held up in a posture of defence over the book, and the cap, the proper emblems of law and liberty, a suitable device. … I confess that Obedience is the sovereign duty of a soldier; but obedience to whom – first, to his God, then to his Country; next to the Laws, and last of all to his King. In 1820 Cartwright went on trial in Warwick for his part the previous year in the “seditious” election by a large pro-reform rally in Birmingham of Sir Charles Wolseley as the city’s “legislatorial representative” or alternative MP, and was fined £100. 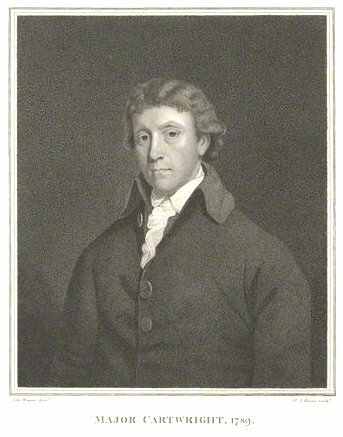 He died in 1824, and in 1826 his Life and Correspondence was published in two volumes by his niece, Frances Dorothy Cartwright. Lawson’s 1872 Historical Record of the Royal Sherwood Foresters states that the first colours of the regiment carried the arms of the Lord Lieutenant and those of the county; this may well have been so, but in January 1779, as already noted, the regiment was certainly presented with a pair of colours that bore Cartwright’s regimental “device”, featuring the cap of liberty. Inevitably, Cartwright was sympathetic to the cause of American independence. It’s hardly surprising that radical Whig notions of a free militia as the guarantee of a nation’s liberty should have fed through to those who framed that nation’s constitution. It’s only a pity that their ideals should have been subjected to such distortion in our own times. 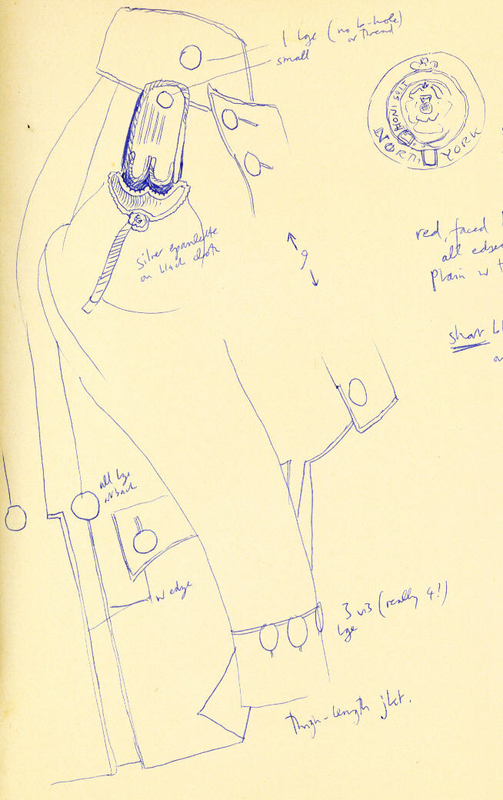 Other pages of the album include a design for a drum major’s staff head (described as a “hilt”) for the Loyal Birmingham Volunteers, and a rather solemn and sensitive image of a teenage boy that may well be a self portrait. Phillp died in his late thirties, in 1815. The central of the three buttons is listed as 276 in Ripley & Darmanin’s English Infantry Militia Buttons 1757-1881 and as 165 in Ripley & Moodie’s Local Militia Buttons. I’ve not seen any evidence that the other two designs were ever manufactured. Presumably this one was the choice of Colonel Lord Dundas. In the mid ‘seventies there was an officer’s jacket with buttons of this design on display at York Castle, attributed to the 5th North Yorkshire Local Militia, though Ripley & Moodie list this button for the 2nd NYLM. As the jacket itself was silent on the matter, while a different, unit specific, button is known for the 5th, who can tell? I made a sketch of the jacket at the Castle at the time, but since then it seems to have travelled on to the Green Howards Museum.